Despite much procrastination, I managed to more or less keep my resolution to finish Mass Effect 2 before Mass Effect 3 came out. I’m going to say that I’m happy that I didn’t spend a whole lot on ME2 (thank you, Steam Christmas sales!) because the game was really, really short. It was a filler. If I had not obsessively spent the time making sure every star system was 100% scanned and loading up on Element Zero, I would not have had quite so many hours of game play. I was surprised to learn that the trip through the Omega 4 Relay really was the end. But, having only spent a minimal amount of dollars, I won’t complain about the brevity. The game did what it had to do by presenting a further chapter in the war against the Reapers and (re)introducing many characters to build your team and giving you a chance to really get to know them through more than just on-ship conversation options. 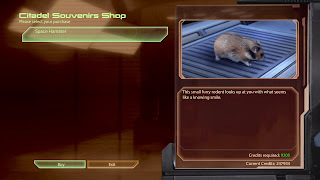 The object of this installment is to work for Cerberus (which my Molly Shepard does with as much love as she did for the Council – who cares if Cerberus spent billions to resurrect both Shepard and the Normandy!) to collect a team, make them loyal and then take them on a suicide mission to stop the Collectors. One would think it difficult to get people to join you on a “suicide” mission, especially when they don’t know you. But join they do, and this is where the fun is. Bioware put a whole lot of thought into the characters, their history and motivations and their relationships (and potential relationships). A good chunk of my time was just running around the Normandy chatting with everyone, with particular focus on Mordin and Joker who were so awesome that they earned themselves their own album in my screenshot collection. It was lovely to see familiar faces all over the place. 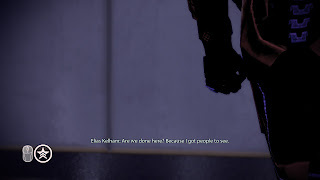 I genuinely came to love the characters from ME1, and Bioware knew this and was tugging on my heartstrings. I fell in love with Garrus in this game (hands off, Kelly), and I refer to Jack and Grunt as my kids. Unfortunately, while all my old team were all “Shepard! ! I don’t like this Cerberus business, but boy am I glad to see you!” Ashley was all “Cerebus? 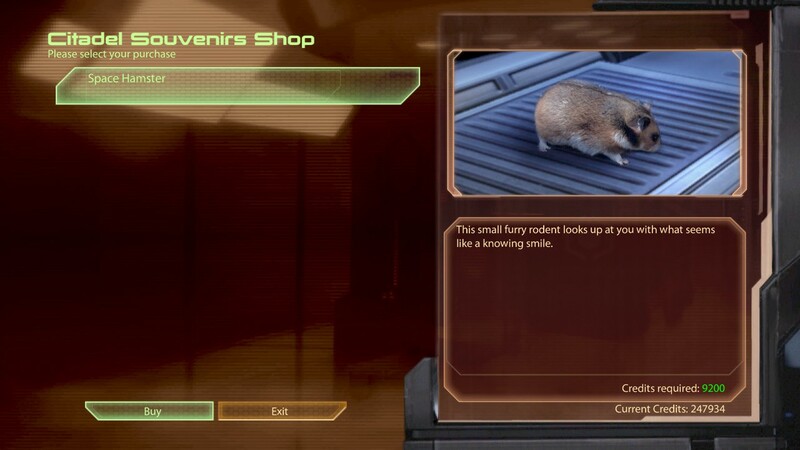 Really Shepard? I thought I knew you! <flounce> ” I did not appreciate the dialogue options for me here because (A) there was no opportunity to punch her and (B) there was no opportunity for me to ask why the hell she was hiding behind a crate while I was busy trying to save the colonists from the Collectors. I don't let colonists die if I can help it. Fish, on the other hand... As with my reality, my fish died. The hamster is okay, but I am really pissed that I was not able to take my new puppy home. I'm sure Kelly could have fed Urz for me! The amount of characters and combinations was a bit overwhelming. There is good reason for this, which you find out at the end, but it was hard to choose who to take with me on various missions. I finally settled on Jack and Garrus, but, having chosen a Soldier class this time, I lost out on my tech abilities. I still had my blessed sniper rifle though. Headshot. Oh yes. Special love for all the drinking and punching I got to do. I spent a lot of time unconscious in toilets. But the punching was definitely a highlight. I only punched people that deserved it though. And monkeys. So back to this loyalty business. I messed up Thane’s loyalty mission and I purposely ‘failed’ Zaeed’s because Molly Shepard does not let colonists die (‘cept a couple of those ones on Feros, but, you know, their own fault for getting possessed). I understood that this might result in their deaths on the suicide mission. Imagine my disappointment when they didn’t die. In fact, I didn’t lose anyone on the suicide mission (and earned the achievement). What’s the point of a suicide mission if no one actually dies? Death makes for the drama! Even though I knew Kaiden would die on Virmire and I wanted him to die, I got a little teary-eyed when all was said and done. So for this reason (and because I did not successfully express my new found love of Garrus because he was too busy with his calibrations), I decided to start a second play through before I can start ME3 with a clear conscience. Mass Effect is definitely WAY shorter than the first game, and the side missions aren't as good aside from Overlord and Arrival, which definitely rival Bring Down the Sky, especially Overlord for me. Overall I really enjoyed ME2 though I agree, the mining slowed it down a lot. But I was a bit annoyed about having to work for Cerberus because well, I didn't want to when I was being heroic! I was being heroic! So since then I went to see the Council and they were all, "Well you can be a Spectre again but NO MONIES FOR YOU SHEPARD," I thought, why not let you refuse the Illusive Man and go see the Council and then when you're leaving have him show up and be like, HEY SHEPARD, BEHOLD MY MIGHTY WALLET. And that would have made it feel less annoying that I had to work for him. I also was a bit confused about how you're brought back from the dead. I mean, dramaticness sure, but I was surprised that they didn't make a big deal about the Prothean crap in your brain from ME1, like that's why it worked or something. Seemed like a missed opportunity. Other than that and Ashley though (BECAUSE OMFG SRSLY, WHY CAN'T I PUNCH HER FOR HIDING BEHIND A CRATE?! ), I did have a great time playing it and really liked all the crazy science fiction stuff with the geth and the reapers and all the stuff Legion were talking about was super interesting. Also: MORDIN, yes, so totally the bestest ever. But be careful if you play through the suicide mission with the goal of having people die because Mordin is one of the first who the game will choose to kill! So if you want to make sure he stays safe, send him back with the crew. Also it's awesome that you had KIDS too. Mine were Tali and Legion. I really wish there was a Press X To Adopt Tali button. She already flat out told me that I was better than her REAL dad! 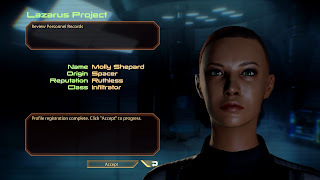 I actually have to go finish off my second playthrough of ME2 today. I just have The Arrival DLC to do now. Ahaha I didn't mind his man pain, but I hated that he somehow thought me listening to him whine = flirting! And then his dialogue when you get him up to your room is so George Lucas horrible! "Press X To Adopt Tali button" LOL! There should have been more with the Prothean stuff and I was disappointed there. There was a side mission I did where I even got another Prothean sequence stuck in my head but nothing came of it. Plus the whole resurrection thing cost billions and obviously doesn't happen every day for just anyone, but most people were pretty cool with it. "Oh hey I thought you were dead." "Yeah. Got better. Cerberus." "Cerberus? Oh well. Good to see you!" Hell ANderson's message was all "Hey I heard a rumour you might be alive again. Drop by for a visit!" I'm torn about the side missions. I appreciated that there weren't so many and that they weren't the exact same layout every time. I miss Thresher Maws and the Mako, but otherwise ... I guess I'd like to see a happy medium between the two games in terms of side missions. Ha, I love your "no option to punch Ashley" comment. that's EXACTLY what I wanted to do in ME1. Kaidan is equally as dickish to you when you meet him. I also stan for Garrus. But why didn't they ever repair his suit?!?! Or get him a new one?! Are they fused to that crap? I feel like everyone messed up Thane's mission. It was really boring. My favorite joker comment was when he talks about being at "headbut capacity" on the ship. I think it was in reference to Grunt. I also just love his "see ya commander" for some reason. Seth Green ftw. 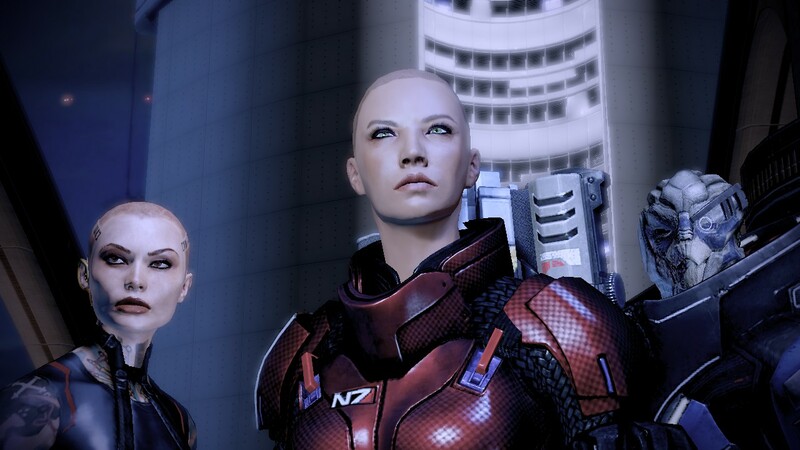 There was also a medical bay to repair Shepard's face, but not Garrus. Maybe he liked the scars? Makes him look more manly. Turiany? I was good and just danced and bought people drinks. lol I made a photo album just for Mordin and Joker because everything they said was hilarious.